It seems that Koi are taking to the bottle. 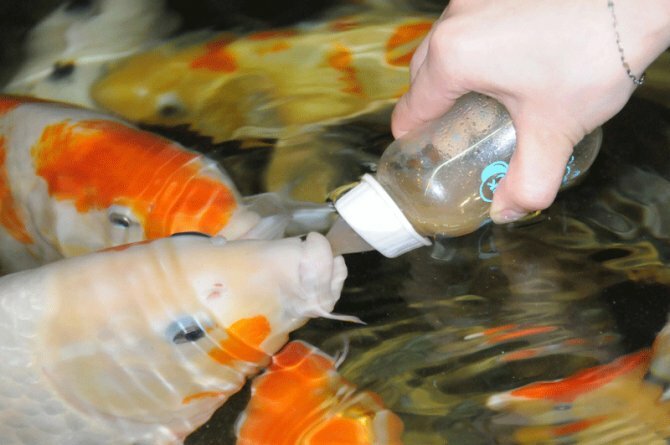 The fish shown here are being fed with a baby's bottle at an aquarium in China. And in the pool of China's Tanhua Temple, located on the outskirts of Kunming City, the resident Koi can be bottle-fed liquid fish food by tourists for a small sum. The idea isn't a new one, it seems. The huge Koi in this video are also enjoying their fish food, delivered via a baby's bottle at Koi Acres in Minnesota, USA. Some of the fish shown feeding here weigh 30 lb.